What kid doesn’t like dressing up for Halloween? The only thing better is dressing up on a random day, meeting up with tens of thousands of like-minded peers, and receiving dozens of compliments on your creative costume. 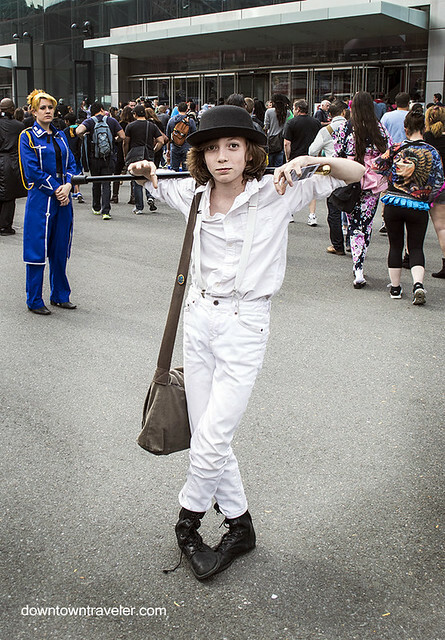 Perhaps that is what draws so many child and teen cosplayers to NY Comic Con. That, and fanboy parents! 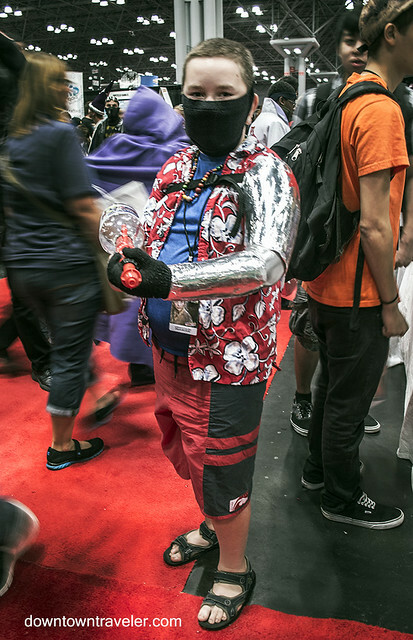 Each year I’m impressed by the passionate boys and girls that pay tribute to their favorite comic, film, TV, anime and video game characters at NY Comic Con. Some come with parents who also dress in costume, while others roam the halls in packs of tweens. In addition to spotting several pregnant woman (no doubt gestating future cosplayers), I met a few babies this year who were already showing their love of pop culture with adorable outfits. Read on for my favorite kids costumes from 2014, all taken at the opening day (Thursday). 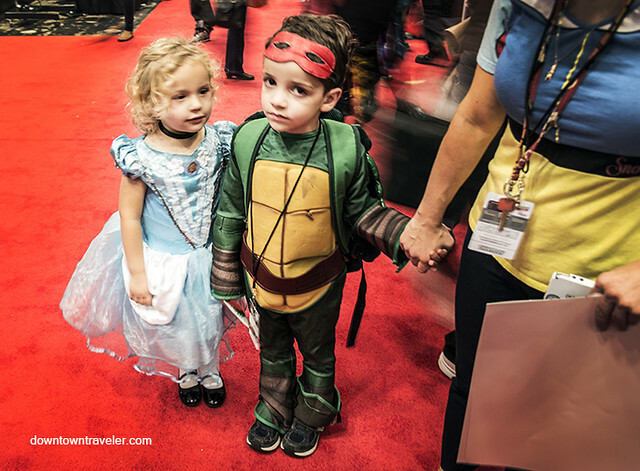 For more photos, check out my 2013 story on best kids costumes! I’m not sure I’d want my kid watching 1960s classic A Clockwork Orange, which was originally rated X for violence. But I was impressed with this teens’s costume: a dead-on representation of the lead character who made milk seem menacing. 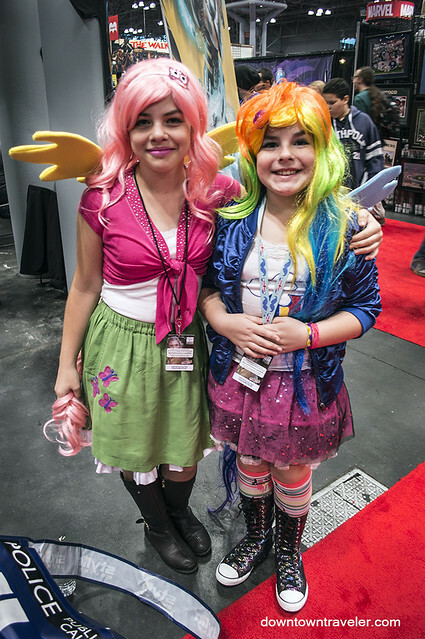 My Little Pony costumes remain popular at NY Comic Con, inspiring a diverse group of cosplayers ranging from kids to women and men (aka “bronies”). These girls described their costumes as “awesome” and I certainly won’t disagree! This boy, visiting the Con with his dad, proves you don’t need to spend hours in a makeup chair to have a recognizable costume. He dressed as vampire slayer Blade, memorably portrayed by Wesley Snipes in the film trilogy. As a non-viewer, I gather the most beloved character from the Dr Who universe is the 11th Doctor, based solely on the popularity of the costume at NY Comic Con. Tweed blazers and red bowties peppered the convention floor this Thursday. One of the more creative looks was worn by this boy, who attended with his mom. 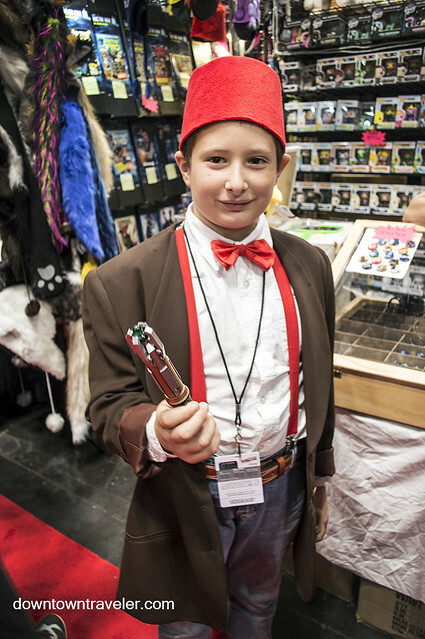 He created his 11th Doctor costume using items purchased from Hot Topic (who knew they were in the cosplay game?) and a thrift store. 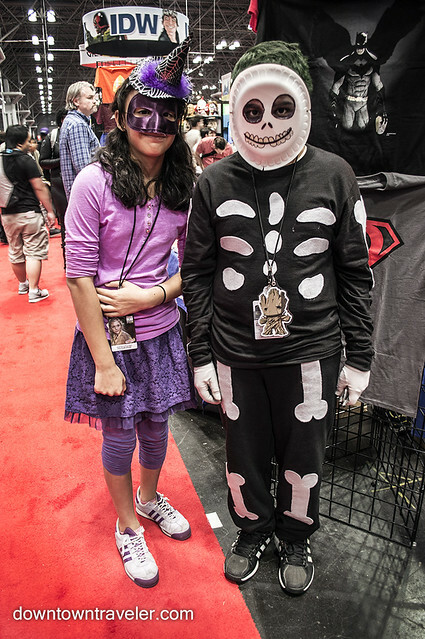 This homemade skeleton costume caught my eye for its attention to detail and simplicity. By attaching felt bones to a sweatsuit and donning a styrofoam-plate mask, this boy crafted an impressive Jack Skellington costume from Nightmare Before Christmas. I did not catch the name of his companion’s character, but they were a creative duo! 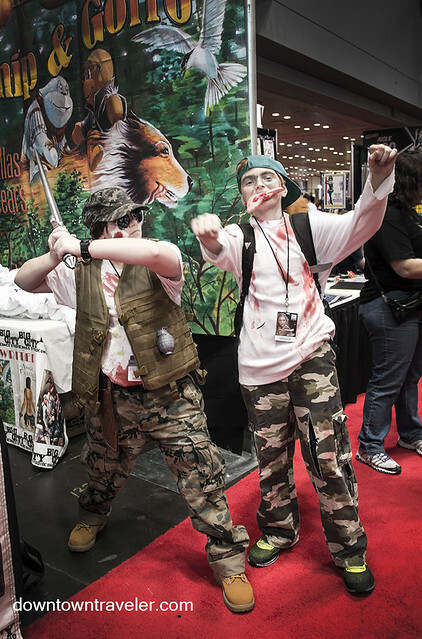 Perhaps the most enthusiastic kids I met at 2104 NY Comic Con, these boys were dressed as a zombie killer (L) and a zombie (R). A smiling mom was present to hold their extra props, like a severed hand and a piece of human flesh. As with many cosplayers, they gamely switched poses for several photos. 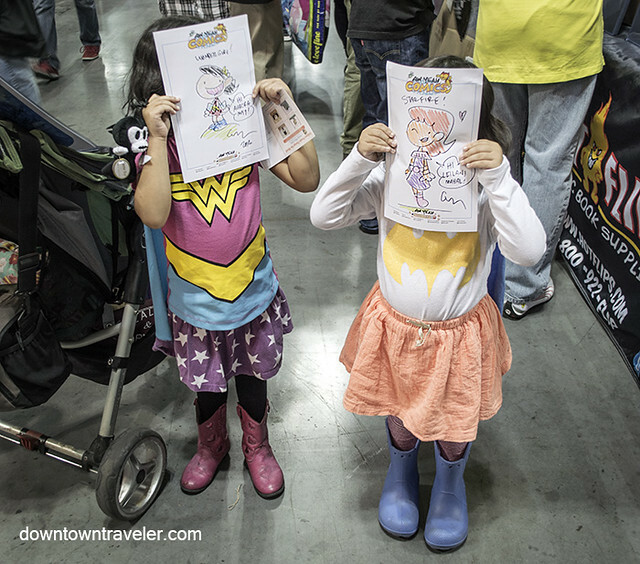 Comic Con is a great place for kids to unleash their creativity! I met several boys and girls dressed as homemade characters or who created their own twists on well-known figures. 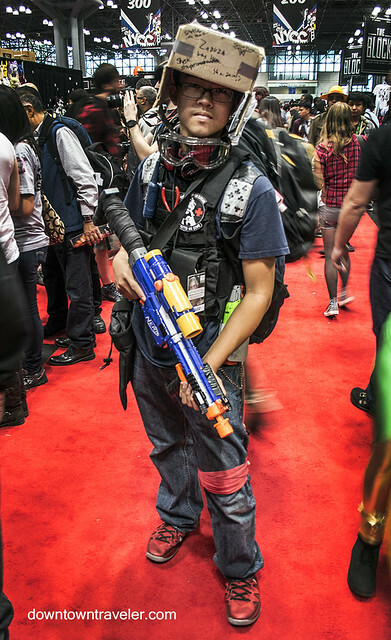 This boy was dressed as “Summer Soldier”– a take on Winter Soldier from Captain America. I spotted this boy and his also-costumed brother hanging out with their mom on the convention floor. After asking me who I was, he agreed to pose for photos in his “Justice Man” costume, a role he created. Sometimes an outfit speaks to you, even if you don’t have a character in mind. 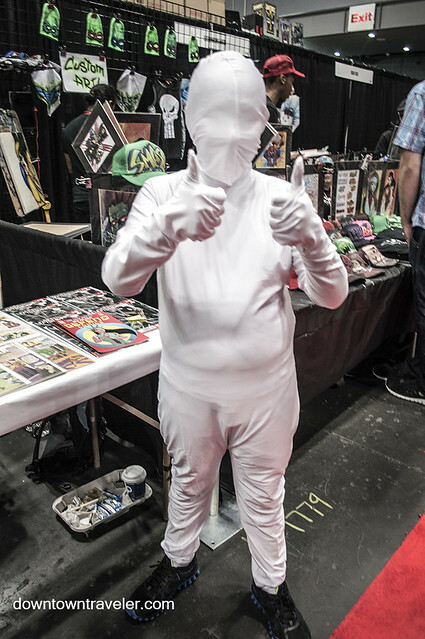 This boy donned a white bodysuit with limited visibility (thankfully his dad was present to guide him), but it didn’t relate to a specific character. Showing the blurry line between performance art and cosplay, this young man dressed in an outfit he often wears on the weekends– complete with flak jacket and goggles– but added an empty box as headgear. He invited everyone he met at the convention to sign the box, making it a memento of his visit. What a clever idea! Some costumes seem to be driven more by parents than kids. 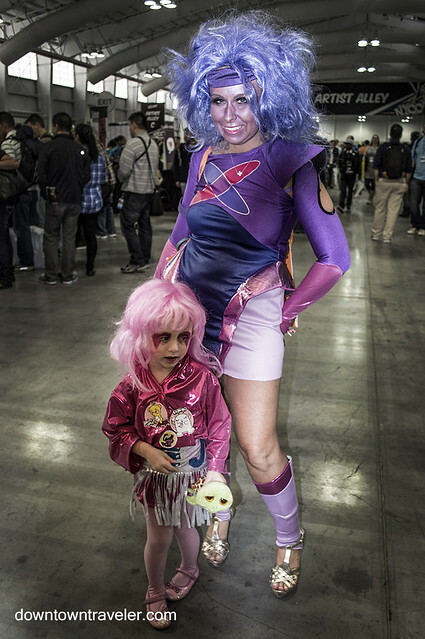 This little girl was dressed as cartoon rocker Jem, who had her heydey in the 1980s. Having grown up with Jem and The Holograms, I was getting a bit nostalgic at the sight of this costume. The Batman universe remains a leading source of costumes at NY Comic Con. While adults and teens seem to favor the villains, the smallest kids are typically dressed as Batman or other heroes. These teens wore dramatic makeup for their Joker costumes. These little girls dressed as Wonder Woman and Batman as they roamed the booths at Artist Alley. They were clearly excited about the custom drawings they’d just received at the convention. Parents often dress in costume alongside their little ones. This aspiring Batgirl got a lift from Batman. 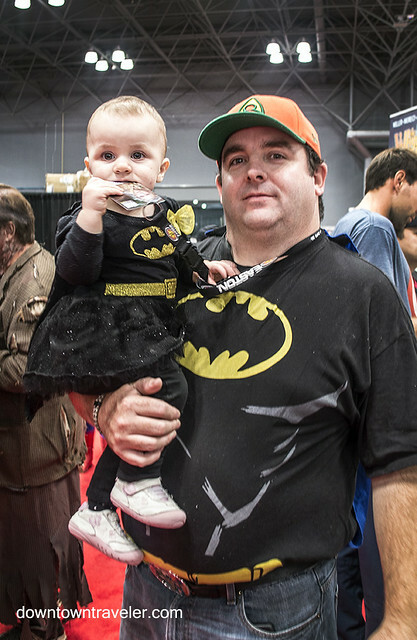 With all of the Batman costumes at the 2014 convention, who wore it best? 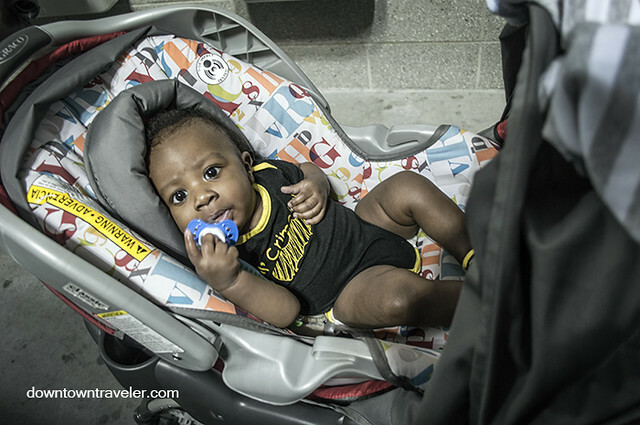 My vote goes to this baby Batman, whose look consisted of a onesie and matching pacifier. He seemed to be enjoying the event, as his parents attended to him in a comfy stroller. 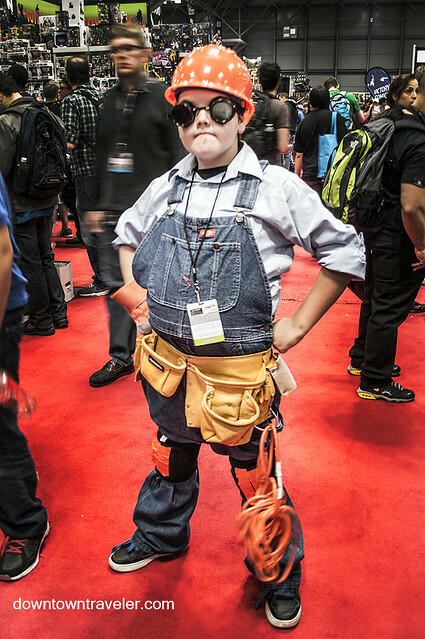 This Engineer costume from Team Fortress 2 is incredibly practical, since it can be reused to help renovate a house. 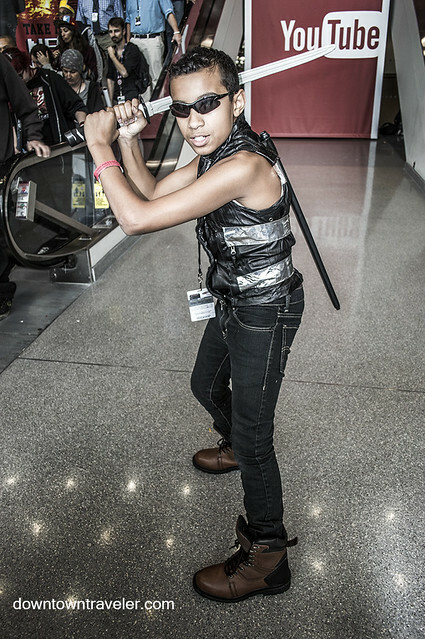 Who are the sassiest cosplayers in New York City? 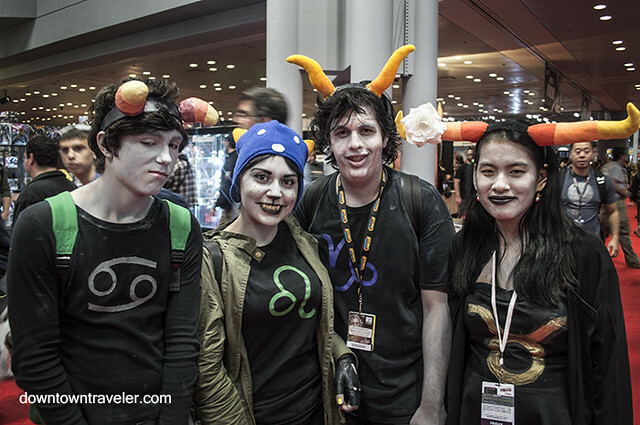 The award goes to the packs of teens and tweens dressed as characters from the web comic Homestuck. Do your homework before attending the Con, because they will give you sarcastic answers about their characters! 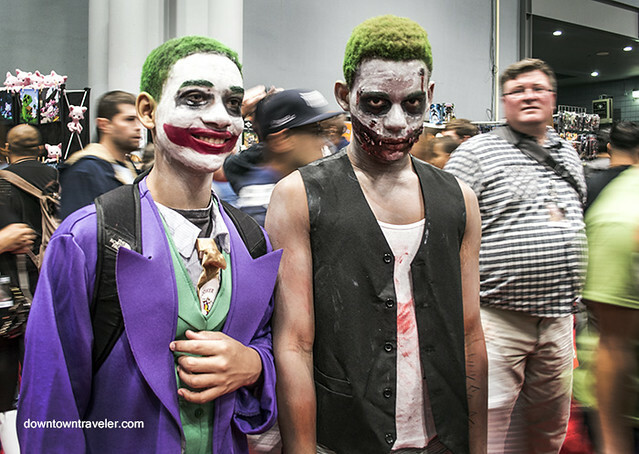 Easily recognizable for their blue/gray face paint, these young comic fans also dominated the kids costume category at 2013 NY Comic Con. Families that Con together, stay together! I ran into this trio of siblings with their mom, who was also dressed in costume and who assured me that their cosplayer dad was nearby. 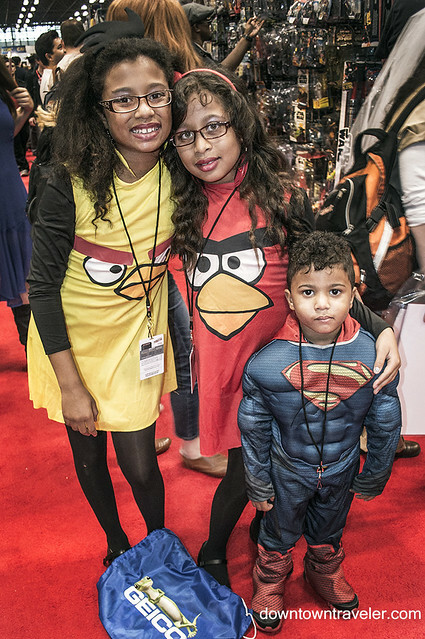 The girls dressed as Angry Birds, which was surprisingly not widely represented on the first day of NY Comic Con. Pokemon remains a tried and true costume for the under-25 set. 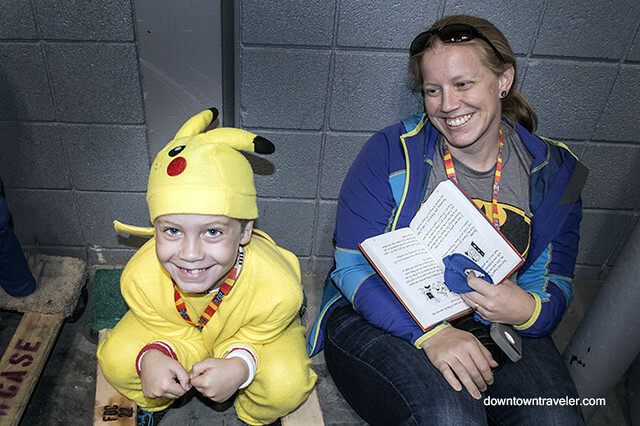 This little boy is the brother of “Justice Man” (whose photo appears earlier in this article) and took a break from the hustle and bustle of the convention to read a book. Kudos to his mom for raising such studious and enthusiastic comic fans! Hollywood movies tend to have an outsize effect on costume popularity. Last year Thor and Loki were popular costumes, while in 2014 Guardians of the Galaxy took center stage. 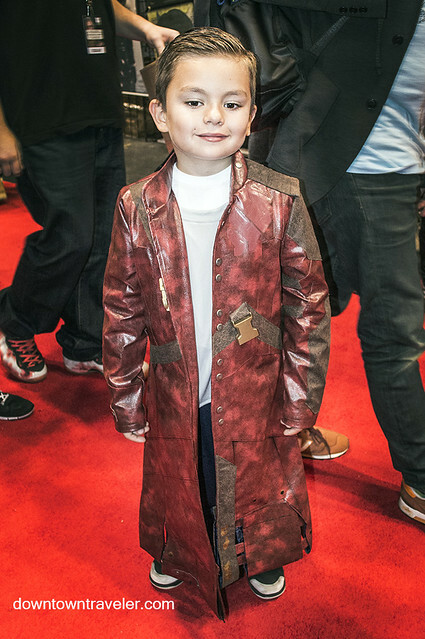 This boy, who attended the Con with his dad, was the youngest Star-Lord I spotted at the convention. Families don’t have to dress alike to make an impression. 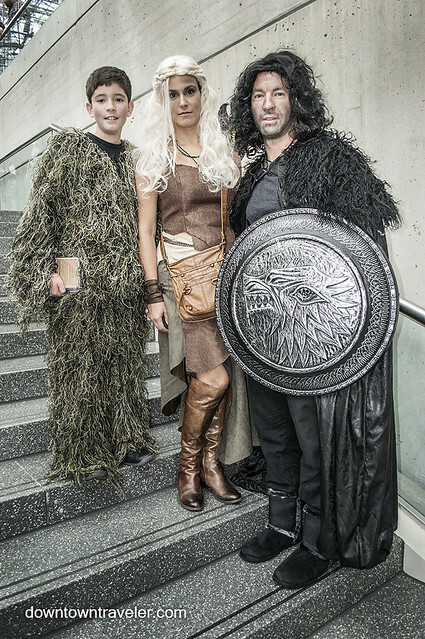 The adults in this trio were dressed as Khaleesi and Jon Snow from Game of Thrones, while their younger companion donned a grassy bodysuit that defied explanation. There didn’t seem to be a specific character represented, but the suggestion of “Sasquatch” was thrown around by the paternal figure. Perhaps that would make an interesting episode of Game of Thrones— the Lannisters versus Big Foot! Teenage Mutant Ninja Turtles is sure to be a popular kids costume this Halloween, and this young boy nicely pulled off the half-shell look. He didn’t attend the Con with the girl in the photo, but their parents thought it would be cute to pose them for photos (and it was)! While not a full-on costume, this hair stands out as a work of art. 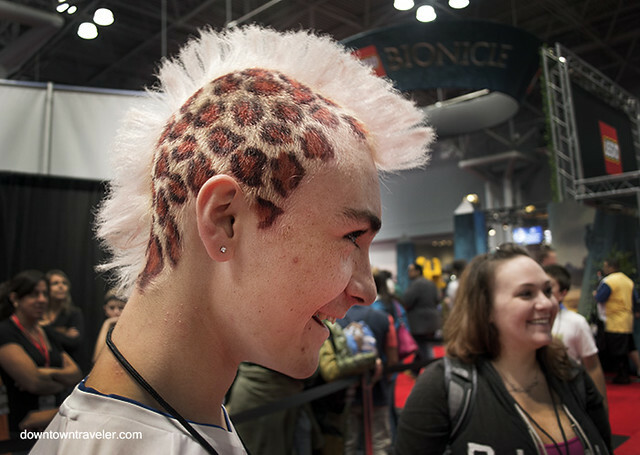 The leopard-print mohawk was created by this boy’s mom (at right in the photo), who used q-tips to apply the color. She is definitely the coolest mom ever! What’s your favorite kids costume? Share your opinion by leaving a comment below! 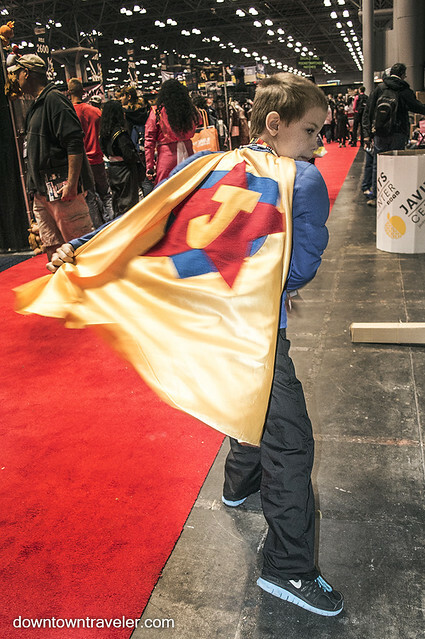 For more photos, check out these articles about NY Comic Con 2014! Love the Mohawk! Definitely coolest mom. Now how about you, cool mom? You are glowing!